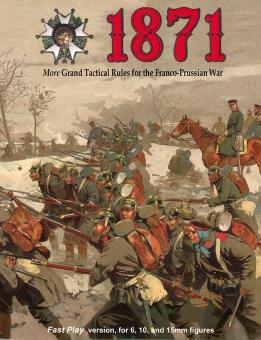 1871 fast-play rules for the Franco-Prussian War-- the latest in Bruce Weigle’s popular “1870” series of rules for the mid-19th century European wars of transition. While 1871 features the same tried-and-true game mechanics as his earlier 1870-1859-1864-1866 rules, the fire combat, charge/melee, and morale sections have been radically streamlined – effectively halving the time it takes to play each turn. 1871 is completely compatible with the earlier rules, and includes ample designer’s notes, color illustrations, examples of play, and twelve new historical battle scenarios (from both the Imperial and Republican phases of the war). It does not repeat the extensive historical or bibliographic information already found in 1870, however. Each well-researched scenario includes complete orders of battle, historical notes, map, and alternative scenarios; they range in size from relatively modest battles of a couple of divisions to multi-corps debacles. Well-illustrated with contemporary artwork and terrain board pictures; a one page color quick reference sheet is included. Approximately 65 pages, spiral-bound, full color.